“¡hola”, “Pozdravljeni”, “你好” … How often do you have troubles understanding and assisting your international customers? While finding a local partner might be the best solution for high priority markets, offering a live chat customer service with high quality automated translations might be the best alternative for other markets. What is the ISL Pronto – GeoFluent integration? This integration is a result of our recent partnership with Lionbridge Technologies, Inc. (NASDAQ: LIOX) and it combines our live chat support software for website, ISL Pronto, with Lionbridge’s automated translation agent GeoFluent. Whilst ISL Pronto enables real-time interactions between website visitors and help desk operators, the newly integrated GeoFluent service delivers instant translations of their text chats. Quality translations into and between 30+ languages are initiated on-demand by customers and operators within the existing ISL Pronto chat application. What exactly does ISL Pronto do? ISL Pronto lets you respond directly to your online visitors and offer immediate sales or technical assistance. Instead of navigating through the phone service, a customer just clicks on the ISL Pronto “Live chat” widget on a website and thus gives a ring to your operators, defines the issue and gets the support promptly. When in a live support session, they can text chat, co-browse, use phone-calls, a video conference, and share the desktop for easier remote support. How would GeoFluent benefit you? Once you’ve got live support channels in place to assist customers online in real time, you may still be missing one key ingredient for the communication to flow smoothly: the lubricating effects of speaking the same language. While that’s not an issue with domestic customers, assisting international customers is a different story. This is where the automated translation solution GeoFluent comes very handy. How does GeoFluent integrated into ISL Pronto work? This Lionbridge’s smart translation agent enables the customer and the operator who do not speak the same language to chat with each other in a relaxed natural voice each in their own language. GeoFluent automatically translates every bit of their text conversation into more than 30 languages. As an example, what do you think your English operator would do if a Slovene live chat visitor asked him/her “Pomagajte mi nastaviti ISL Pronto na spletni strani”? Froze?? Or perhaps transferred the chat to a Slovak fellow operator and hoped the magic would do the rest? 🙂 If your support centre used ISL Pronto with GeoFluent, an English speaking operator could easily assist a Slovene customer in plain English, while the Slovene customer would reply in Slovene. How will you benefit from the ISL Pronto – GeoFluent integration? •	increased customer lifetime value. What do prime users say about the integration? 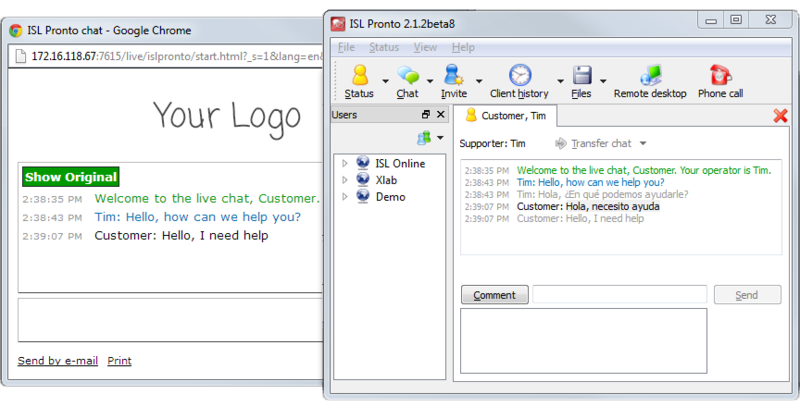 “Having been a satisfied user of ISL Pronto for four years, we appreciate the recent efforts and dedication ISL Online and Lionbridge have shown to provide improvements and new features in the live chat solution. The integration of ISL Pronto with an automatic translation provider like GeoFluent has proved a success at the tech level. Now our call centre can easily and quickly support all customers no matter the language and without waiting time,” Santiago Pérez, IT Head of Europ Assistance Spain welcomes the new functionality*. *Europ Assistance Spain is a part of the Europ Assistance Group, the oldest and most experienced travel assistance network in the world. How do you get the ISL Pronto – GeoFluent integration? The integration of ISL Pronto with GeoFluent is offered as a standalone solution with its own server installation. More information on ISL Pronto with GeoFluent is available at www.islonline.com/technology/integrations/geofluent.htm. This entry was posted in instant messaging, ISL Pronto, ISL Pronto - GeoFluent, live chat and tagged automated translations, customer service, live chat, live support, quality translations, remote support, support centre. Bookmark the permalink. Having translated words in your live chat is also a great way to communicate your audience that doesn’t speak English. Good features on having this kind of chat tools. Same with offerchat that does analytics report on your live chat to track all transactions and chats made by the customers.